An otherwise inspired tribute to natural history buries the fossils of Darwin’s theological ancestry and misses its chance to challenge Intelligent Design. When “Darwin: The Evolution Revolution” first opened at New York’s American Museum of Natural History in 2005, creationist critics were among its first visitors. Reviews on Intelligent Design blogs found the show “biased” and “dogmatic,” and, even worse, burning with a “Darwinian fundamentalist” zeal. What gives? Thousands of visitors have already enjoyed this exhibit in New York, Chicago, Boston, and Toronto. 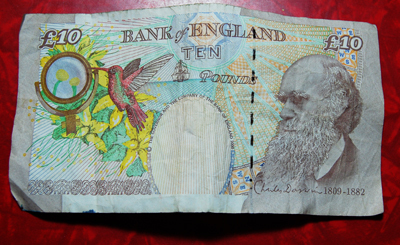 It’s currently on display at the Natural History Museum in London, as Britain gears up for the 200th anniversary celebration of Darwin’s birthday on the 12th of February. Will hordes of visitors look back on the exhibit and remember what a hard time those doctrinaire Darwinians gave God? I doubt it. In fact, Intelligent Design will be the last thing on visitors’ minds as they reflect back on “Darwin.” And frankly, I think that’s a shame. If an exhibit about Darwin’s legacy is not the perfect place for biologists to face the Intelligent Design movement, then where will they do so? This exhibit promises to unpack the wild and woolly head of one Charles Robert Darwin and, to a large extent, it delivers. We meet Darwin in his privileged early-19th-century childhood, where he picked up the compulsive habit that would haunt him his entire life: Collecting the flotsam and jetsam of the English countryside when he should have been studying, making him a “scapegrace” according to his physician father. But Darwin turned his disgrace into a virtue, learning to “look closely” at all of nature, mastering the ultimate “simple tools” of an authentic biologist, his own eyes. These two themes of the exhibit, “Looking Closely” and “Simple Tools,” are put to elegant use, connecting visitors with the lived experiences of Darwin. We peer through Darwin’s magnifying glass and stand in a replica of the study where he wrote the great tomes of his adulthood. The exhibit shares iconic Darwinian stories, like his mad questing for beetles, which drove him once to “collect” a beetle in his mouth, for want of a free hand. The beetle spewed an acrid repellant, an effective way to avoid being eaten, whether by a hungry bird or a desperate naturalist. Paired with historical artifacts—in this case, beetles collected by Darwin himself—these stories bring him to life and reveal an intimate contact with nature, cultivated from childhood onward. When I caught the exhibit last year at the Royal Ontario Museum (ROM) in Toronto, I had a chance to speak with its local curator, entomologist Chris Darling, who shares more than just a passion for insects with Darwin. As a child, he too spent a lot of time outdoors, laying the experiential foundation for his life as a biologist. According to Dr. Darling, an urgent concern addressed by the exhibit is “the demise of the naturalist,” the disappearance of biologists who concentrate as intensely as Darwin (who spent nearly a decade becoming the world’s expert on barnacles) while maintaining a broad base of knowledge and experience, observing and cross-referencing information from diverse sources. And the exhibit certainly samples from many of these diverse sources, bringing home the enormity of Darwin’s accomplishment. That is, the synthesis of such a swarm of biological and textual information that most people would simply give up and go home. In this exhibit you may catch African spurred tortoises mating, touch a replica of the giant extinct armadillo fossil that Darwin found in South America, and witness moments of startling insight, recorded in Darwin’s own hand, in an original research notebook. Visitors to the ROM on opening day were dazzled by the dual quality of breadth and depth on display. “How could you not be impressed by a man who acquired so much scientific knowledge during his life?” commented a young woman, an American tourist who proudly informed me of her Christian faith. Another visitor, an aging Torontonian schoolteacher, struck by Darwin’s wealthy background, saw the exhibit as a demonstration of what can be accomplished by specialist scientists when they have sufficient resources to delve deeply into a topic. Natural history museums worldwide should applaud this exhibit for the case it makes in support of “Darwinian” science: Visitors see the value of collection and careful observation, and the ever-expanding catalogue of life that is the backbone of modern biology. By contrast, the molecular tools that many of today’s evolutionary biologists use in their daily work merit no more than a cameo. For this omission we can hardly blame the creators of the exhibit. After all, “Darwin” is already packed with artifacts and ideas, and its creation must have been an excruciating surgery, where the organs excised seemed just as vital and vibrant as what remained. Pride of place is rightly given to the specimens, tools, and documents of a Victorian naturalist. Yet, despite the success of this central theme, the curators’ scalpels went astray when they carved away the history of Darwin’s theological education. What seemed like a vestigial organ to them—a useless bit left over from our ancient ancestors, like your appendix or coccyx—was more like Darwin’s carotid artery, the wellspring of some of his most important observations. At the risk of sounding a lot like those complaining creationists, I protest: there wasn’t enough Intelligent Design in the exhibit! And I’m not talking about bringing in the masterminds behind the Big Valley Creation Science Museum in Alberta to give “Darwin” a facelift. Instead, I’m talking about the very heart of Darwin’s scientific training at Cambridge, natural theology, which took his love of “looking closely” at organisms and turned it into a scientific skill. Why? Because the best comparative anatomists of the day, Darwin’s own mentors and colleagues, saw the shared skeletal structures of different species, known as homologies, as evidence of God’s design, his master plan for the living world. Darwin was able to challenge this view only because he had assimilated its lessons so fully. When the young Darwin looked closely at the world, he saw those homologies just as clearly as his colleagues did, as evidence of design. But like other good observers of his day, Darwin began to see the flaws in this approach. If God were so intelligent, why would he give a bat’s wing, a human’s hand, and a whale’s flipper the same skeletal structure? Didn’t he have the basic engineering chops to devise specialized designs, better suited to the job that each type of limb does? As Darwin learned more about anatomy, collecting animals both extinct and extant, he came to see homology as evidence for evolution. And he had no trouble convincing his colleagues, also students of natural theology, of the same. Today, homology still stands as one of the most vivid demonstrations of our evolutionary heritage. Our human hands share a skeletal structure with a bat’s wings and a whale’s flipper because we all share an ancestor in the distant past. How can we explain this oversight? It may be, as ROM CEO William Thorsell commented at a media preview, that “Darwin is still too hot to handle.” After all, “even in Canada,” it was impossible to find corporate sponsorship to support the exhibit until nearly a week after its opening. In seeing the controversial content on their hands, perhaps the exhibit’s creators decided that Darwin’s training in 19th-century “Intelligent Design” was better left unmentioned. In portraying his religious sentiments as nearly nonexistent, they sanitized the exhibit of Darwin’s dirty little secret, his theological education. We learn that Darwin, who was trained as a clergyman at Cambridge, brought a swanky engraved German Bible on his five-year voyage around the world, along with his more practical pistol and “peacemaker” club. Anyone who has studied Darwin’s letters could tell you that he was, in his own words, “a very poor German scholar,” an insight that confirms what is implied by this display case: the Bible was just an accoutrement of travel, perhaps more effective as a weapon than as a source of inspiration. Nearby, a biology textbook is displayed, branded with the kind of disclaimer sticker disseminated by the Intelligent Design movement, claiming that evolution is “only a theory.” Another video tries to answer this challenge: scientists stand again in a featureless room, talking at the visitor, explaining that a “theory” in science is not merely a guess, but a critical “framework” within which facts are understood. But these videos are all just talk. Visitors have been told time and again, before they even arrived at the “Darwin” exhibit, that science is dynamic, self-correcting, allowing its most treasured principles to be toppled in the face of solid evidence. Ironically, the story of natural theology, so carefully avoided in this exhibit, is a real-life account of just how such foundational concepts in science may be challenged. Though it is neither biased nor fundamentalist, as creationists claim, in overlooking the “Intelligent Design” in Darwin’s own intellectual history, this exhibit misses an authentic demonstration of the ideals it professes. Worse, it sidesteps a meaningful discussion of Intelligent Design and why—as science—it just doesn’t cut it.